We had made two visits to the cave previously. The first came to a very abrupt end when we found the wrong key was on the fob for the cave. Our second attempt was met with a little more success as the we got into the cave, but was on a day when it was raining so we turned around before we reached the main passage. Collecting the key from SWCC we headed off to the Gower and after a slight navigational challenge going through Swansea, we found our way to the top of the wooded valley at Llethryd. We walked down the track looking for the charcoal kilns by the side of the track that once marked the location of the cave. After we reached the main clearing in the woods we realised something was wrong and searched around for the cave. We located Cathole before heading back up the track to find that the only remains of the charcoal kilns was a patch of burnt ashes by the side of the track. We were not quick enough to enter the cave and were eaten alive by swarms of horse flies. Now in the cave the faffing did not stop as we decided that we wanted more than a handline down into the first chamber so headed back to the car for some more kit. By 2pm the trip was underway with us all in Bone Chamber and so we headed off through the tight muddy cobble floored crawls that gradually take you to a couple of thruches over cobble banks (the imaginatively named pebble crawl) into the main river passage. Richard Dearden in the section as you enter the Main Passage. Once reaching the Main Stream Passage, we followed the upstream section to the right and soon found that the floor cleared of pebbles as short sections of fantastically scalloped phreatic passage were passed. Most of this passage was stooping height with sections where you could stand upright, and after 200m we reached a section where the passage dropped almost vertically to a landing where two rifts dropped into the static blue sump. We retraced our footsteps taking photos of the dry streamway as we headed back to our entry point. Rachel Dearden near the upstream Sump. Rachel Dearden in the finely scalloped passage. Chris Web in a fine phreatic section. 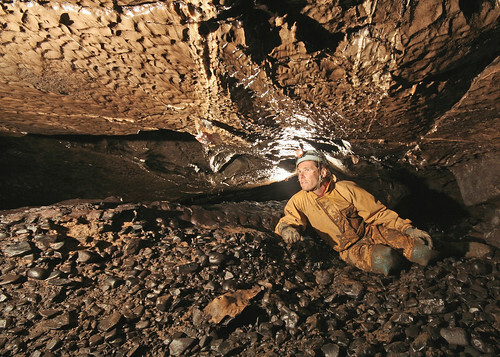 Richard Dearden in a section of the upstream Main Paassage. We then followed the down stream leg of the dry Main Stream Passage which was wide but low and involved stooping or crawling over the cobble floor. After 200m the bottom of a boulder collapse was reached that led up into the Aven Series. Our choice was to make the most of the dry spell and follow the main Stream Passage to the "Big Sump". We were greeted by a dive line neatly tied to rock outcrops that guided our way through this now totally dry passage. Beyond the sump, the passage gains greater proportions with one section a walk on a cobble floor through a tall and wide rift passage. Following the main Stream Passage we entered Christmas Cake Chamber, whose dominant feature is a massive sand and mud slope on one side which is topped off with a beautiful icing of white calcite on top. 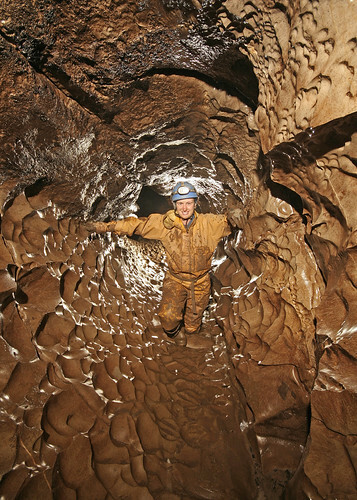 Beyond this chamber the route of the water begins to break up, the passage starting to split into two main routes that both become tall narrow rift passages. Traversing these passages brings you above two of the downstream sumps (dry on our visit). One of the rifts look impossibly tight, but the second has seen the attention of divers in the past. A final exploration of several higher level tube passages in this area followed, one leading to a drop down to what would be the third sump. The group had split exploring this downstream section of the cave so we returned to regroup and exit the cave together. 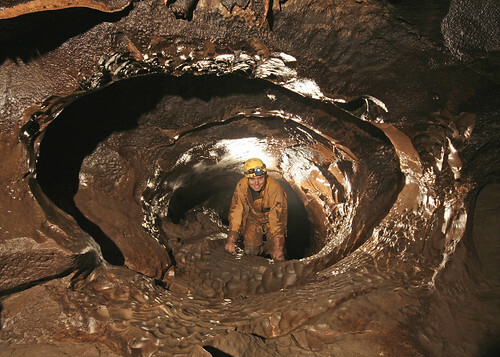 This is a great cave, if you can forget the grovelly entrance series, with plenty of prospects in the downstream passage to be pushed in times of drought. While Jessica was away in foreign climes, Mark wanted to get a few “classic trips” under his belt. This coincided with an invitation to assist with the dig at the end of OBD. "Oh, help!" said Mark. "I'd better go back." "Oh, bother!" said Mark. "I shall have to go on." "I can't do either!" said Mark. "Oh, help and bother!" Now, by this time Keith wanted to go through the choke too, and finding the choke full, he moved towards Mark, and looked at him. "Hallo, are you stuck?" he asked. "N-no," said Mark carelessly. "Just resting and thinking and humming to myself." "Here, give us a hand." Keith stretched out a hand, and Mark pulled and pulled and pulled. . . . "Ow!" cried Mark. "You're hurting!" "The fact is," said Keith, "you're stuck." 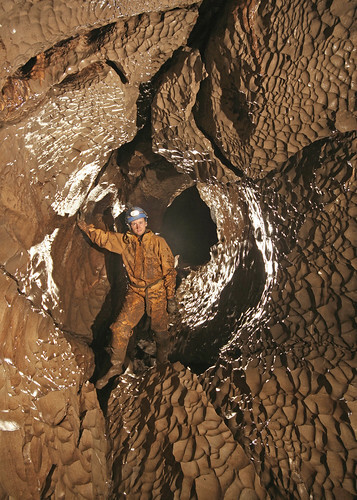 "It all comes," said Mark crossly, "of not having caves big enough." "It all comes," said Keith sternly, "of eating too much. I thought at the time," said Keith, "only I didn't like to say anything," said Keith, "that one of us was eating too much," said Keith, "and I knew it wasn't me," he said. "Well, well, I shall go and shout for Brendan." Brendan was on the other side of the choke, and when he came back with Heather, and saw the bottom half of Mark, he said, "Silly old Mark," in such a loving voice that everybody felt quite hopeful again. "I was just beginning to think," said Mark, sniffing slightly, "that Heather and Alan might never be able to use this cave again. And I should hate that," he said. "So should I," said Alan. "Use the cave again?" said Brendan. "Of course he'll use this cave again." "If we can't pull you out, Mark, we might push you back." "You mean I'd never get out?" said Mark. "I mean," said Keith, "that having got so far, it seems a pity to waste it." “How long does getting thin take?” asked Mark anxiously. So we had no alternative but to make our way back out and spend the rest of the afternoon exploring the Minera “Hoffman” Lime Kiln.